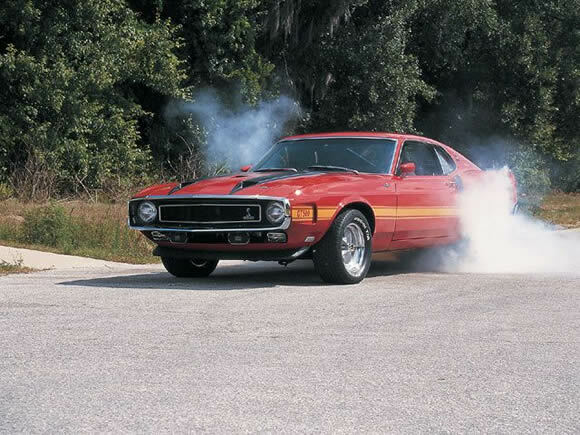 I love a good Mustang and it was hard to going past one doing a burnout. The 1970 Mustang isn't my favourite shape because Ford decided to give it a huge facelift it became a bit of a 70's monstrosity. There are a lot of people who will disagree, especially my mum's neighbour who has 3 of them, but Ford lost the plot a bit here and the cars grew. 4 inches in length alone. Carroll Shelby have discontinued his contract with Ford during this time so even though the 69 - 70 GT350 and GT500's bore his name he had little to do with them. The GT500 had a 428ci Cobra Jet V8 developing close to 400hp but 0 - 60 and quarter miles varied some think for insurance. Still a beautiful piece of Ford muscle and now a rare sort after car.